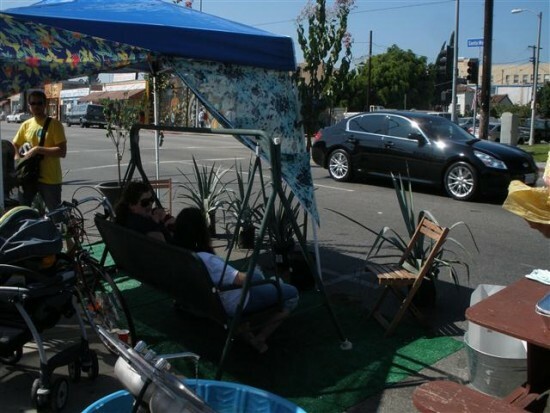 Today was Park[ing] Day LA, the local version of an international event where street parking spaces are converted into makeshift, guerrilla-style open space for a number of hours for the day. The purpose of the event is to create a dialogue to call attention to the fact that more space in cities is dedicated towards automobile use rather than actual human use. Its origins sprang up some five years ago in San Francisco and has since gone worldwide. 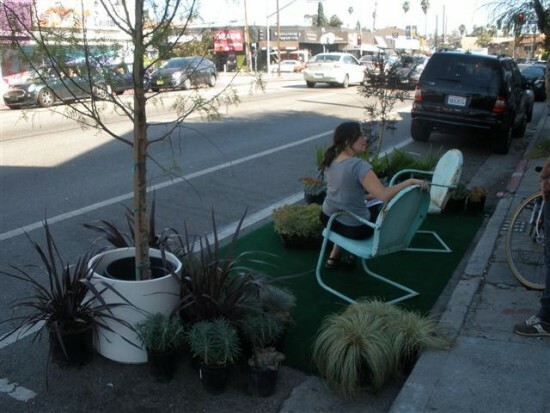 I had been participating in Park[ing] Day in one form or another since 2007, when I first caught wind of the concept from my community organizing exploits. I ran a small park in East Hollywood’s Thai Town that year and in later years helped out friends with their parks. 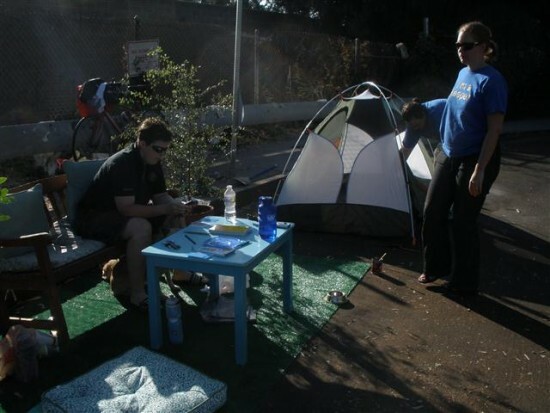 Park[ing] Day parks are usually created by activists, community groups, architects or urban planning students. In previous years there have been as many as 40+ parks in the Los Angeles area, and park creators can register their proposed spaces on the Park[ing] Day LA website. This year, only some 20 parks appeared on the map, though a few more may have been created spontaneously. 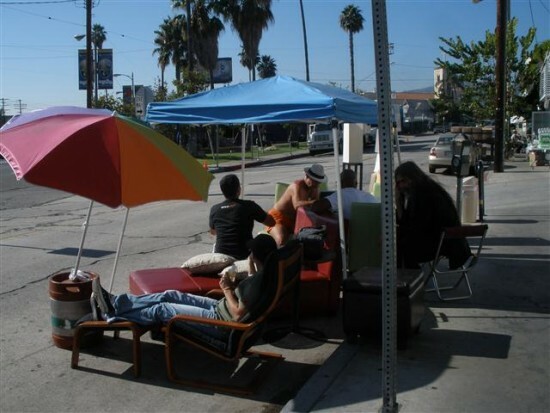 The EHNC, having been the first neighborhood council to participate in Park[ing] Day since 2007, set up its park on the 4500 block of Santa Monica Blvd at Madison Avenue, right in front of the Bureau of Street Lighting maintenance yard. It contained a swing bench over a patch of astroturf, surrounded by a barrier of plants, which doubled as a shield against the cars, trucks and buses that sped by just a couple yards away. There was also a solar-powered water sculpture made from a discarded kitchen sink, a picnic bench with free tamales and lemonade, and a petition on the light yard fence garnering community support for turning the City facility into a recreation center. A car’s distance away from the last park was this park, organized by three urban gardening enthusiasts who wanted to feature the local chaparral flora through educational handouts and actual plants, loaned from the Theodore Payne Foundation. A few plants, purchased by the EHNC, were available for adoption. 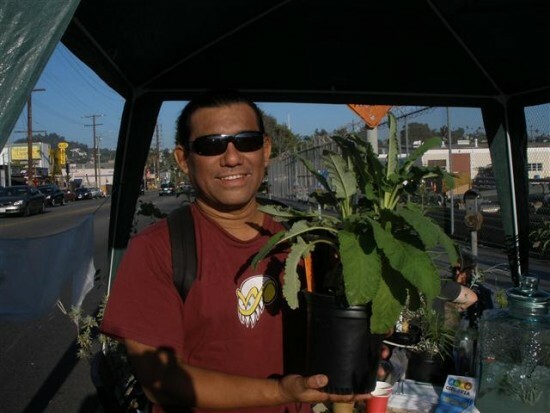 Upon introducing myself to the park’s organizers, I got the reply, “Oh you’re the Cahuenga Library native plant guy!” I guess my rep is…growing, lol. This little green patch right in front of the hipster den that is Intelligentsia Coffee and L’ecole de Flea (a.k.a. The Silver Lake Conservatory of Music) in the sunset Junction area features non-native, but drought-tolerant plants from Everything Gardens nursery in nearby Atwater Village. The nursery caters to a landscape architect clientele. 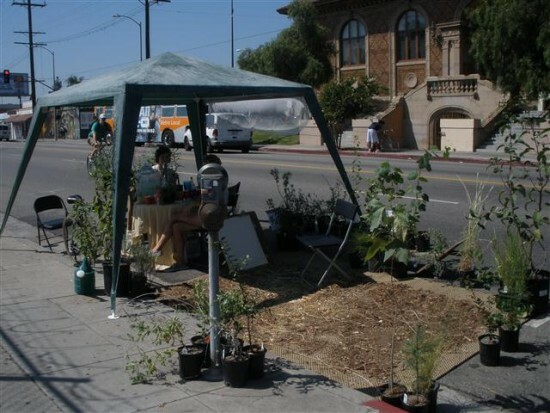 Vanessa Rutter, the nursery’s proprietor, who lives in Silver Lake, has also set up Park[ing] Day installations in her neighborhood in previous years. This park, organized by a group known as WHERE, set up furniture under a canopy on Griffith Park Blvd across the street from the Silver Lake Triangle park (doesn’t that defeat the purpose? ), where half a dozen people converged to either play a game of chess or just chat. One of the chess players was none other than the Silver Lake Five Dollar Guy (now the most well-known living shirtless dude in Silver Lake). As an elderly Filipino couple passed by on the sidewalk, looking at the makeshift park with a confused look on their face, a woman in a compact car pulled up and mentioned that de LaB’s park in front of Local restaurant down Sunset was giving away its plants for free. “You mean I can get some of these plants and sell them for $5? I’d better get down there!” Exclaimed an enterprising Five Dolllar Guy. Bike scene regular, KillRadio.org‘s Paul “DJ Chicken Leather” Bacca, video camera in hand as usual, rode in with a friend and spotted me. He told me all the Downtown parks were closed for the day.There went my plan, but this was already 4 p.m. and many parking spaces are turned into rush hour traffic lanes at that time. After Silver Lake, I rode west on Hollywood Boulevard, turning north on Van Ness, by the new Hollywood fire station and into Canyon Drive, where a simple park with seats, a table, and a tent stood. Nathan French from the Hollywood Seventh-Day Adventist Church and the regular Hollywood Community Walks, was there, explaining to me their park was intended to be a genesis for transforming an adjacent (and neglected)freeway easement space into a pocket park for the community. Church pastor and community activist Ryan bell was also there, and he envisioned the possibility of turning the little-used street into a shared street, or closing part of it altogether. That was all the time I had for the day, as I had to rush back to East Hollywood to adopt one of the Native Plant(ing) flora. I was the proud papa of a well-grown salvia spathacea (Hummingbird Sage) which I propmtly brought over to the Cahuenga Library to plan in the entryway tomorrow. I barely missed the Hollywood Community Studio’s “Streets For Feet” plaza on Hudson Avenue, but that one is open all weekend, so I’ll get a chance to check it out another day.